Hillary Clinton has taken some flack this primary season for following Bernie Sanders’ lead a little too closely in regards to courting young voters. The degree to which that critique is valid remains an open question, but it does make it more than a little bit ironic that Clinton is scheduled to appear on Jimmy Kimmel Live! this week—two nights after Sanders does. 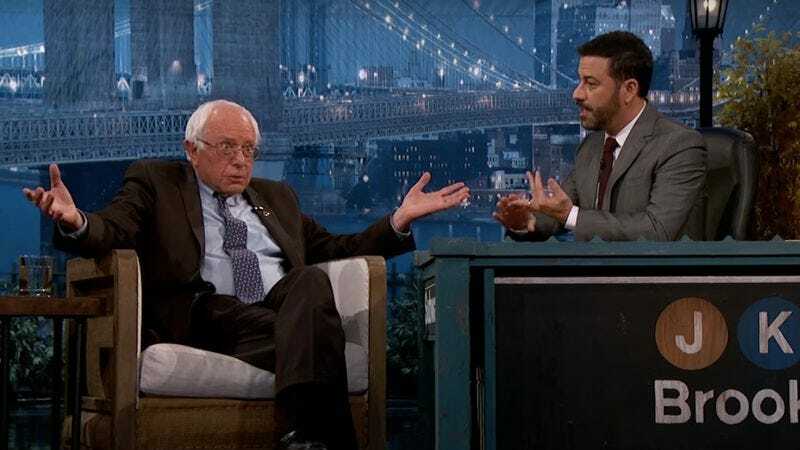 The democratic socialist senator from Vermont will be a guest on Kimmel’s late night talk show tomorrow after polls close in Arizona, Idaho, and Utah. He’s expected to perform better than the five-state blowout he endured last week, so he should be in good spirits. The former Secretary of State then will be sitting down in the exact same spot on Thursday night, probably with Sanders’ cologne still hovering in the air. And since she will most likely continue to hold a large delegate lead over her opponent later this week, she should be in even better spirits.